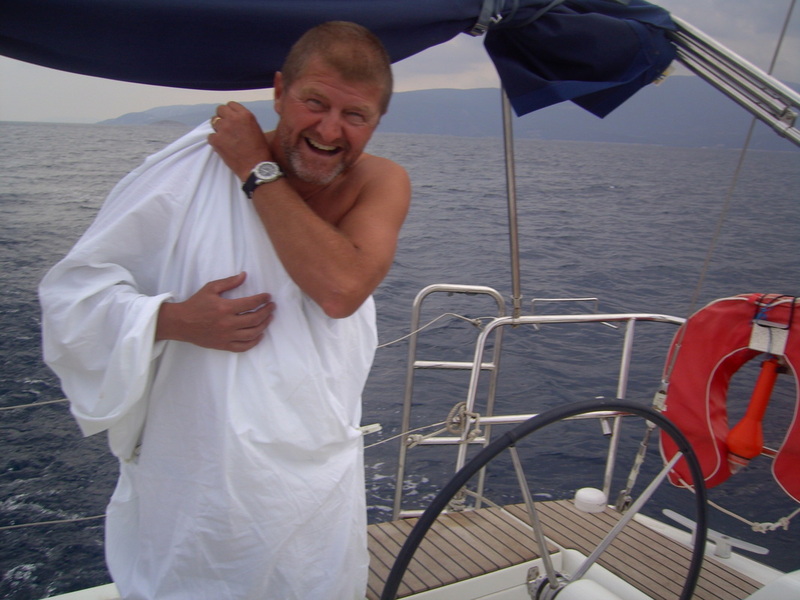 This delivery trip was a 500 nautical mile odyssey across the Aegean Sea departing from the Kassandra Peninsula on Halkidiki in North Eastern Greece and finishing 3 weeks later on the Ionian Island of Lefkas in Western Greece. 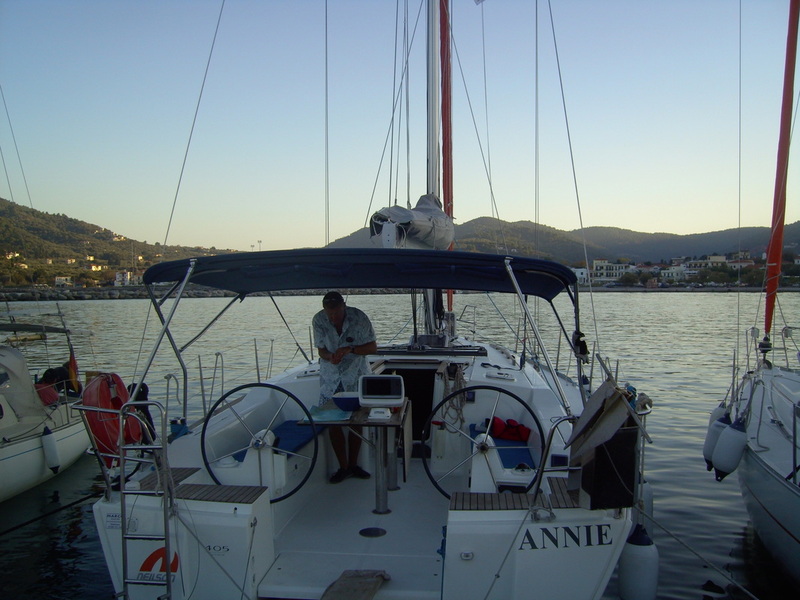 Yacht 'Annie' is a Dufour 405 launched in 2011; a sleek sailing vessel with three berths, two heads (bathrooms) and a wine cellar! 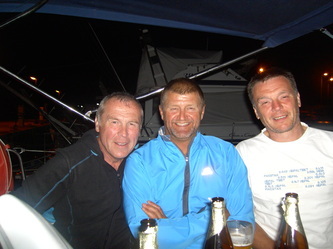 The skipper and crew were SYP Sailing Section members Paul Holt, Andrew Best, Mike Pearson and Dave Pickett. 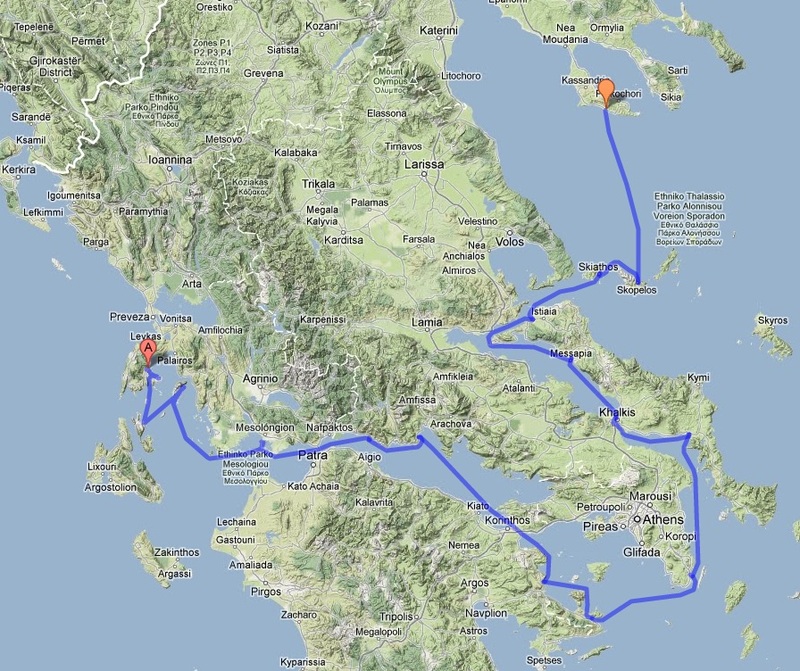 The route included:- Northern Sporades Islands of Alonnisos, Skopolos & Skiathos, West coast of Evia, Cape Sounion, Poros, Epidhavros, Corinth Canal, Gulf’s of Corinth & Patras and the Ionian Islands of Ithaca, Cephalonia, Kalamos and Meganisi. 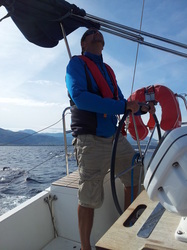 DAY 1 – Arrived at the Neilson base in Neo Skioni; a typical Greek fishing village sandwiched between turquoise sea and pine-clad slopes with a small harbour full of traditional fishing caique. 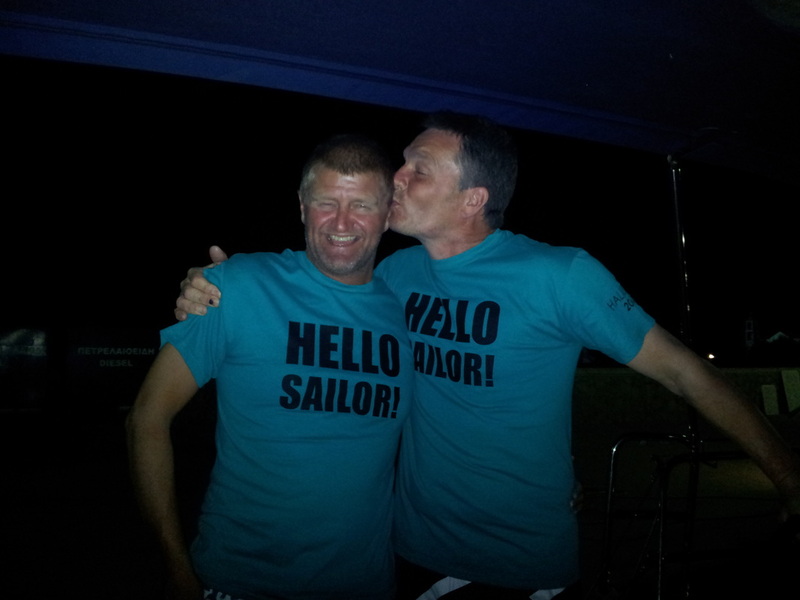 DAY 2 – Neo Skioni. 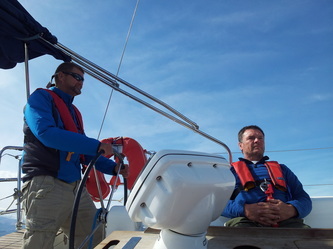 Provisioning and safety briefing. DAY 3 – Skopelos - 55nm. We left the harbour in the dark and motored on a flat calm sea watching the sunrise and the moon disappear. 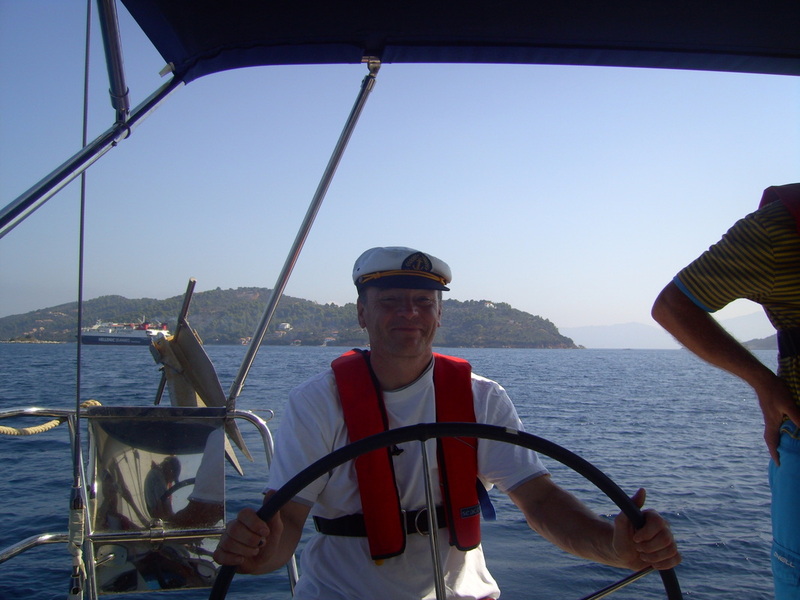 We then had an afternoon swim anchored in the bay at Patitiri on the island of Alonnisos followed by a leisurely beat across to Skopolos town. 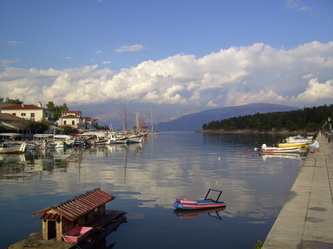 A beautiful town where the houses and churches are piled one upon another around a rock amphitheatre above the harbour. DAY 4 – Skiathos – 22nm. 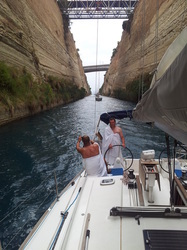 A lunch time stop anchored with a long line ashore in the bay under the rock and church featured in the film MAMA MIA film followed by a swim in gin clear waters and a climb up to the church. 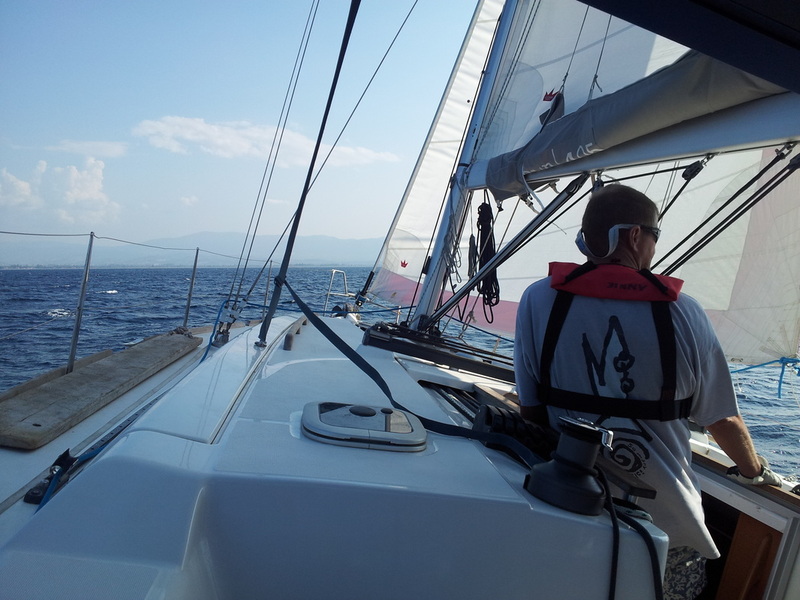 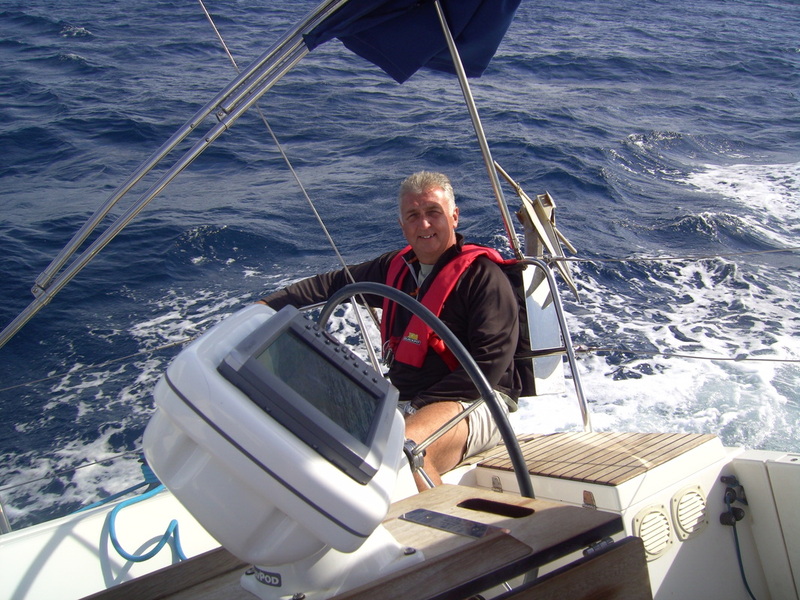 DAY 5 – Platania (mainland Greece near to the Gulf of Volos) - 12nm. A lunch time stop anchored off Koukounaries Beach on Skiathos; said to be the most beautiful beach in Greece? Arrived at Platania late in the afternoon and moored ‘side too’ on the quayside between two very large Egyptian fishing trawlers. Woken up three times during the night and told to move the boat to allow other trawlers to dock and land their catch. 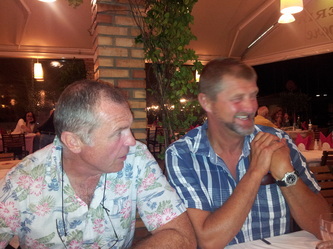 Not good after a night on the Ouzo!! 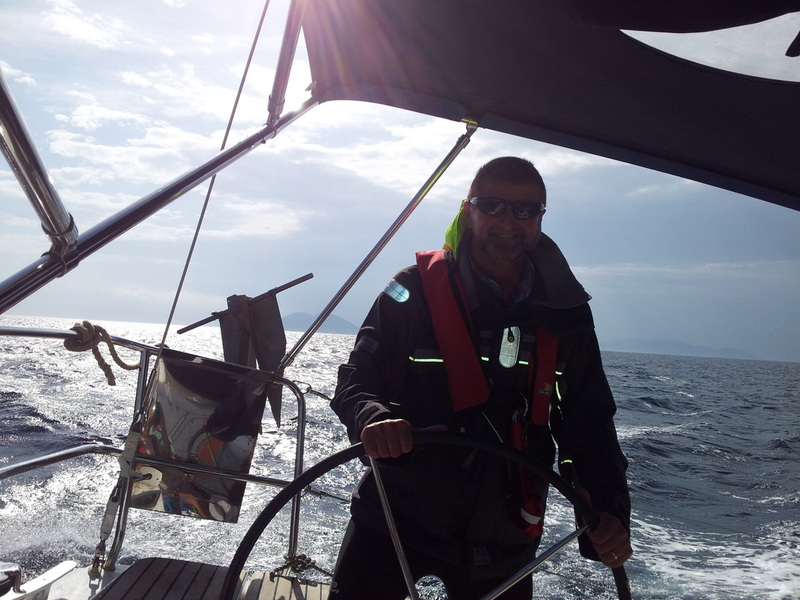 DAY 6 – Orei, Evia – 28nm. 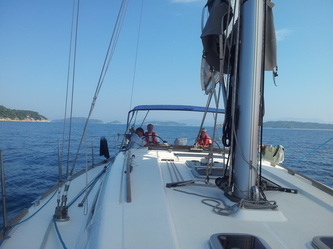 We had lunch at Pigadhi followed by a bracing reach over to Orei. 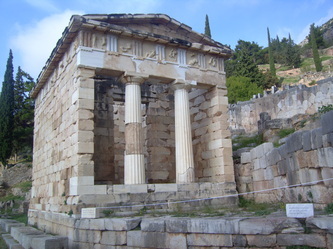 In 1965 a full size Hellenistic marble bull was dredged from the seabed by fishermen and placed in the town square. 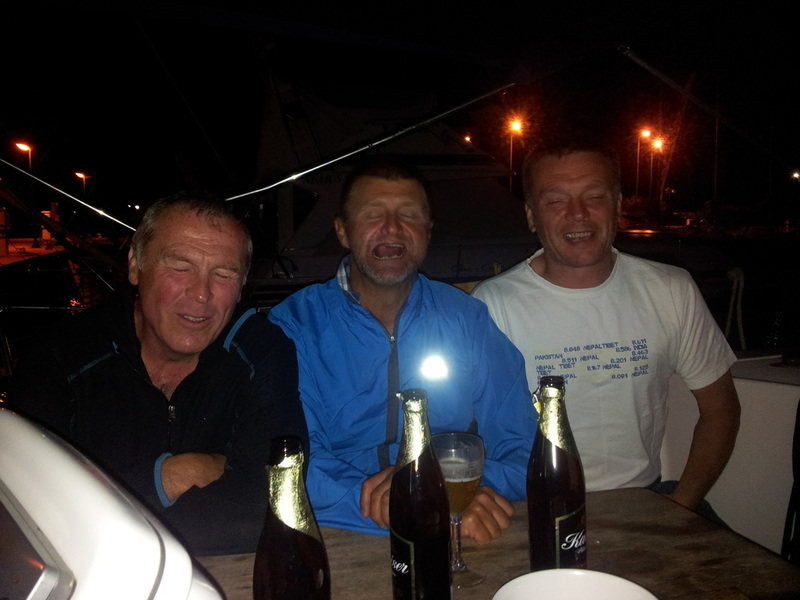 DAY 7 – Limni – 40mn. 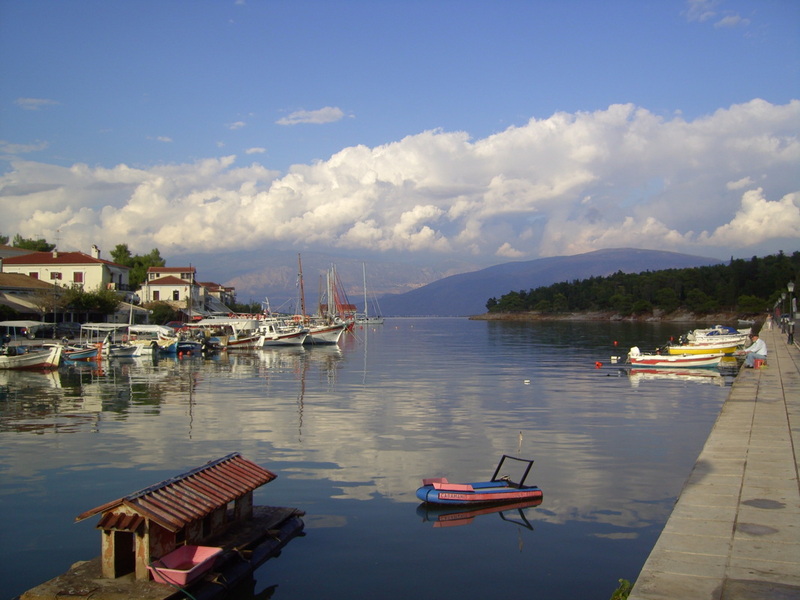 A glorious fishing village on the west coast of Evia with a tiny harbour and a quayside lined with traditional restaurant’s serving fresh squid and octopus. 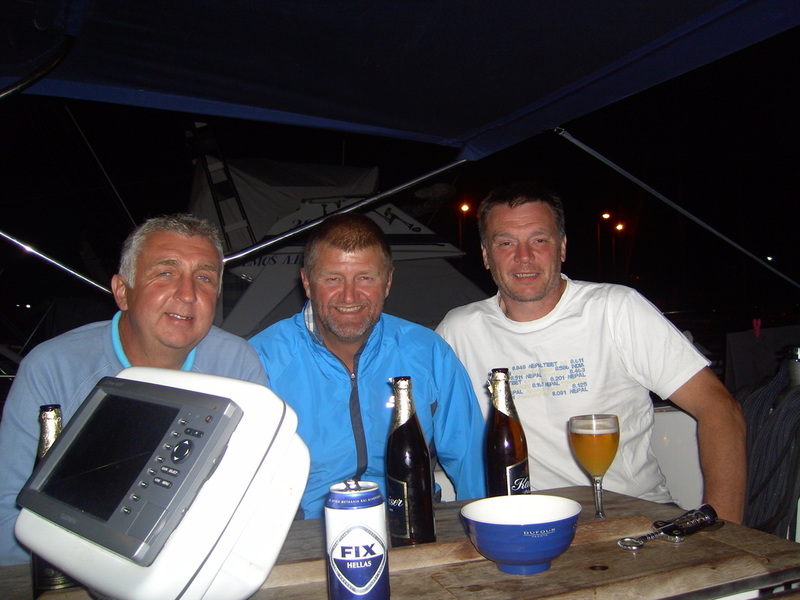 DAY 8 – Khalkis – 32nm. 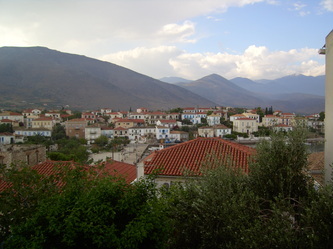 A large town on Evia joined to the mainland by a small lifting road bridge. 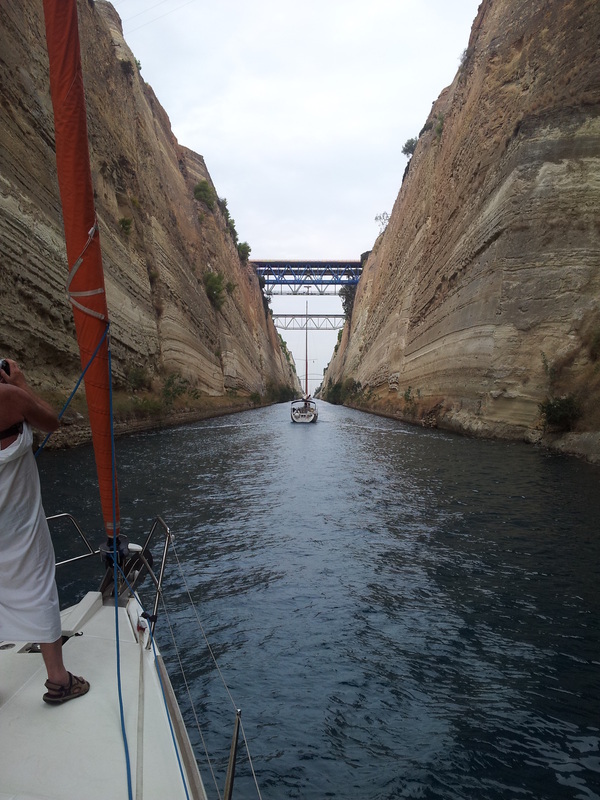 After a fantastic sail down to Khalkis we anchored to the north of the town and waited for the bridge to open. 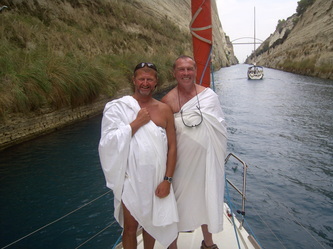 It finally opened at 11pm and we motored through waving to the partying Greeks on the town quay. 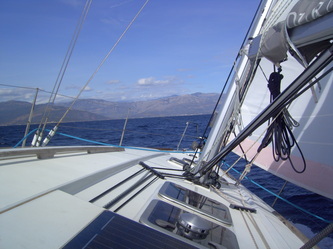 We then anchored for the night in the bight south of the town. 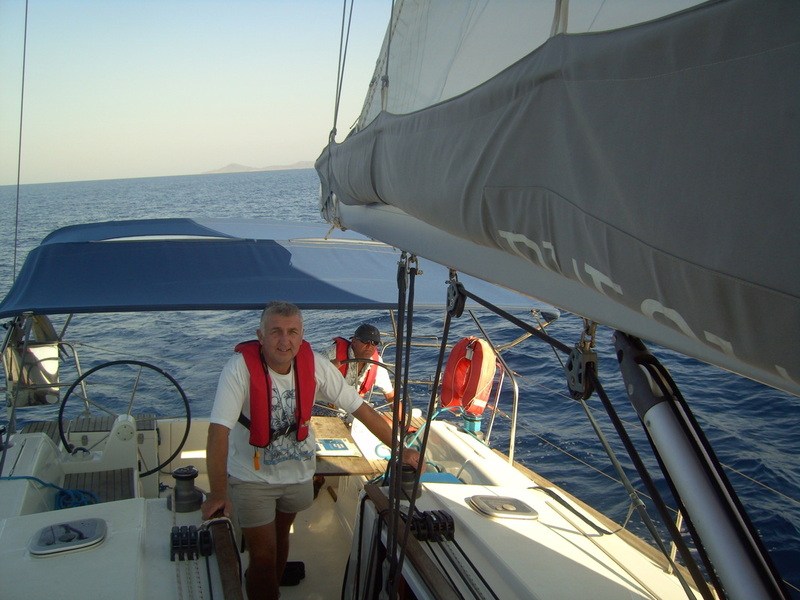 DAY 9 – Karavos (Aliverion), Evia – 25nm. We motored to Eretria where we had a lunch time swim in the harbour before sailing onto Karavos. 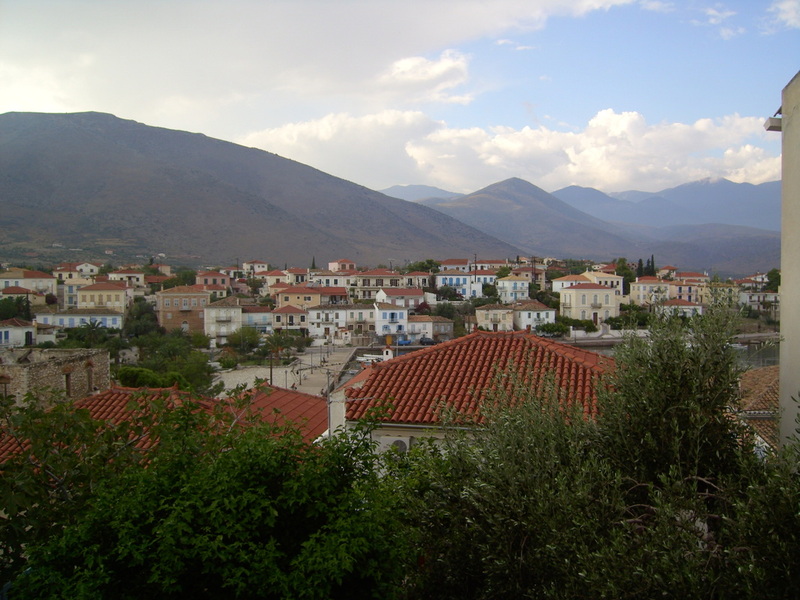 A pretty village somewhat spoiled by the nearby power station. DAY 10 – Lavrion - 46nm. A beat to the headland in 20 knots of wind was followed by a long motor south before the wind picked up again as we neared the entrance to the marina at Lavrion. Ideal conditions for some ‘tacking’ practice for Dave our ‘virgin’ sailor. 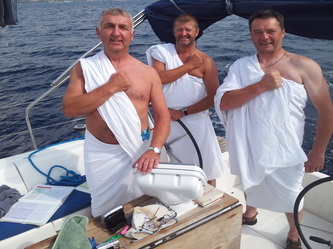 DAY 11 – Neo Epidavros via Poros – 60nm. 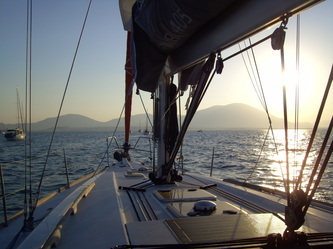 Another early morning start in the dark. We sailed out of the marina into strong winds and a building sea passing the Doric Temple on Cape Sounion at sunrise. 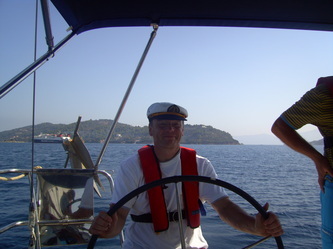 Half way across the Saronic Gulf the wind dropped forcing us to motor onto Poros town. 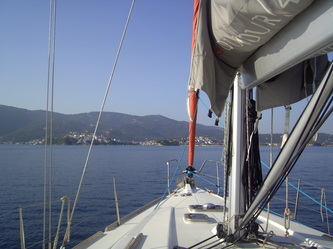 The town built on the rocky slopes is attractive and the approach by sea one of the most beautiful in Greece. 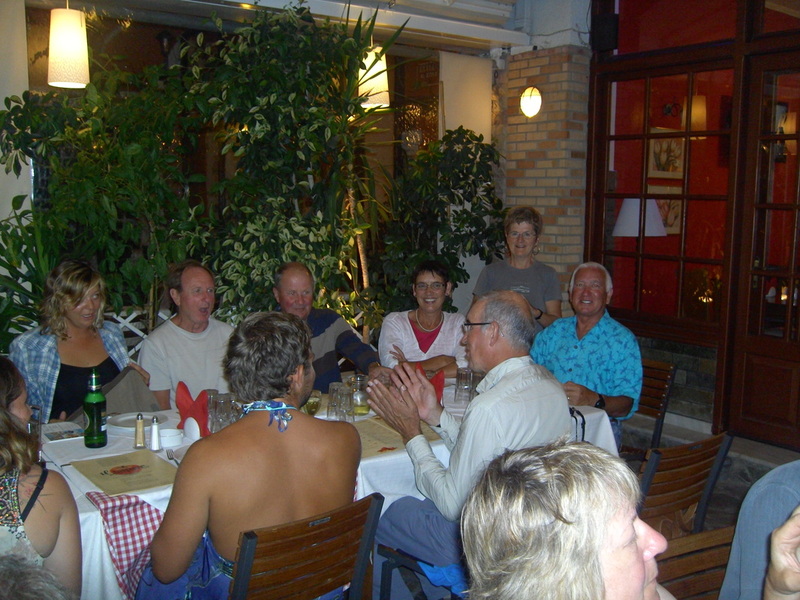 We moored ‘side too’ on the town quay and had a leisurely lunch of mousaka and squid in a taverna next to the boat. 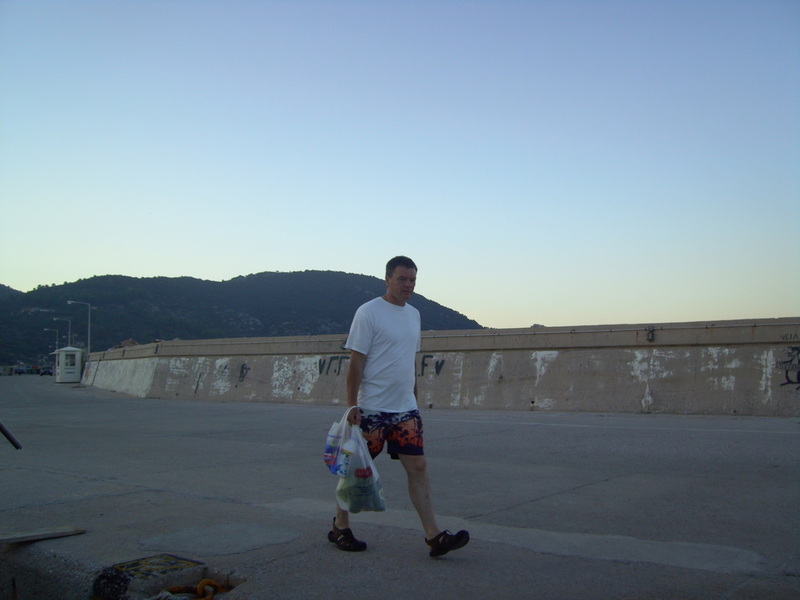 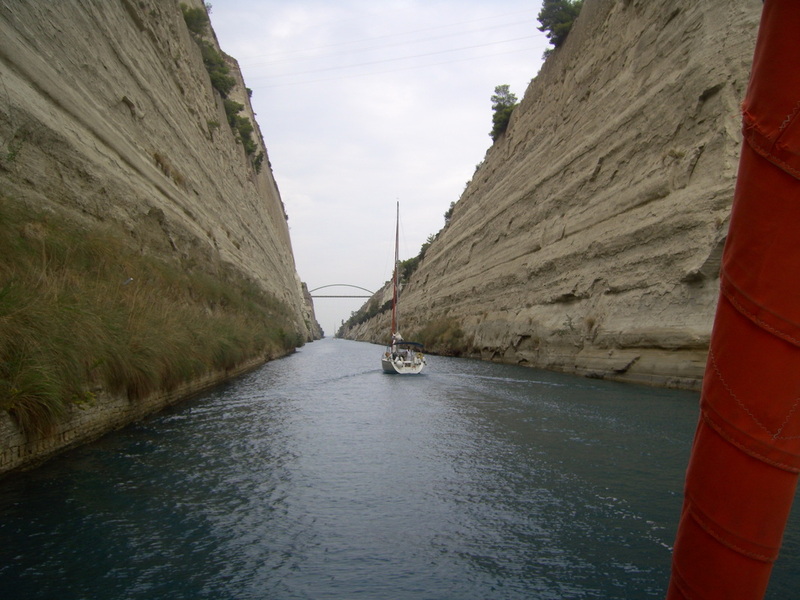 DAY 12 – Corinth Town via the Corinth Canal – 28nm. 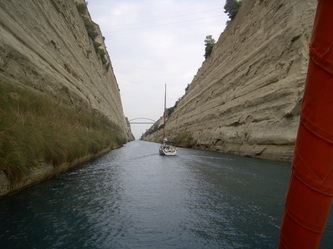 The canal was started by a French company and finished by the Greeks in 1893. It is 3.2 miles long, 25m wide, the maximum permitted draught is 6.5m. 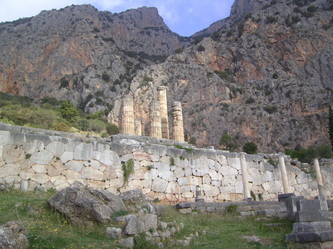 The limestone from which it is cut rises to 79m above sea level. 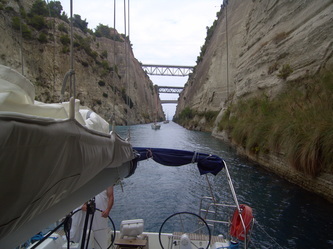 It is controlled by two hydraulic bridges near either end. 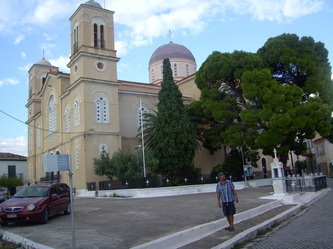 We arrived at the entrance following a lunchtime stop at Korfos and waited for the green light to go through. In keeping with tradition we all donned our toga’s and gave our salutes to the Greek gods! 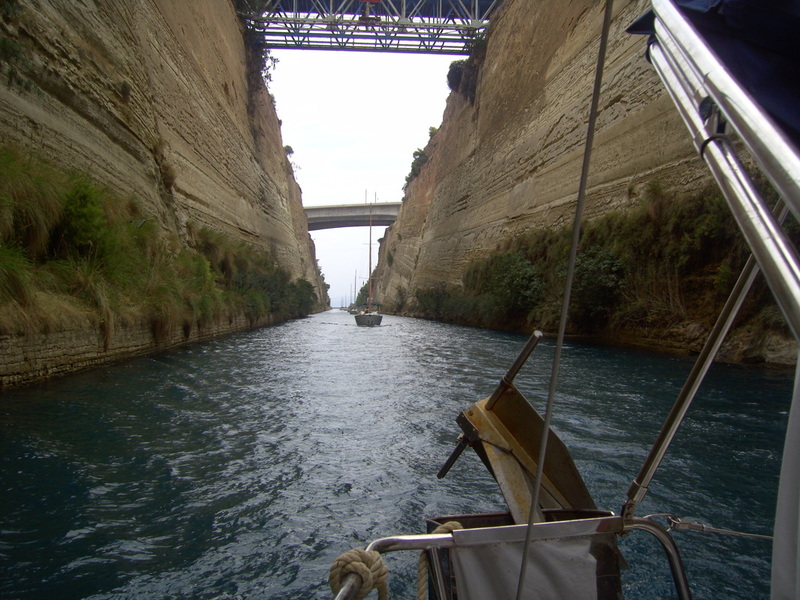 The canal was a fantastic experience which cannot be said of the town which was a bit of a dump. 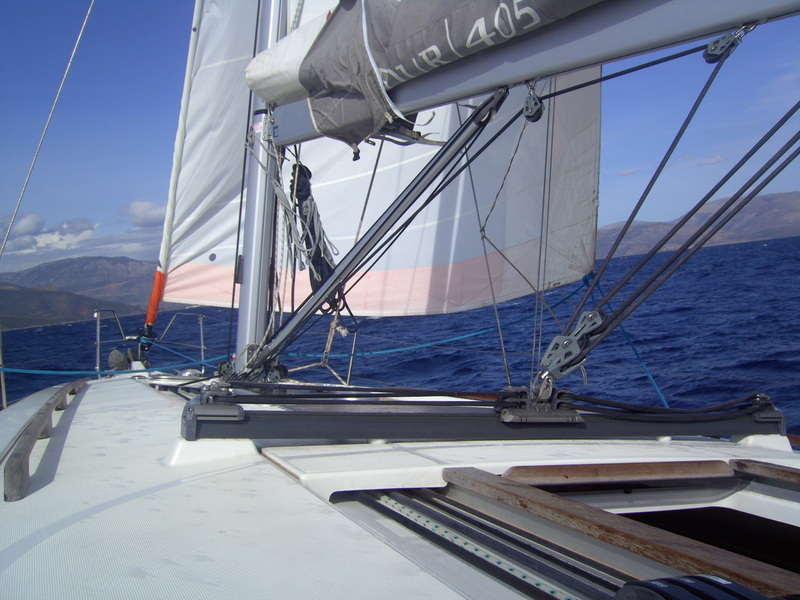 DAY 13/14 – Galixidhi – 37nm. 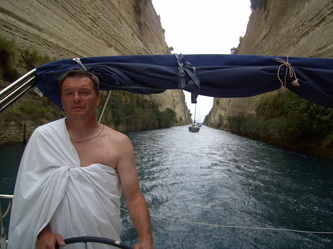 We left Corinth Town in blazing sunshine on a flat calm sea and motored all day to Galixidhi on the northern shore of the Gulf of Corinth. 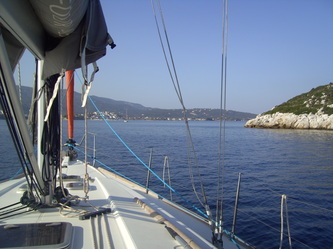 From the distance the rocky islet and stony hills hide the tranquil narrow inlet of Galixidhi harbour. 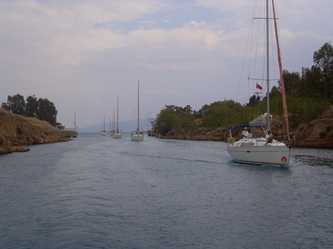 The harbour is hemmed in by a pine-studded peninsula to the east with the town hunched on a rocky mound to the west making it one of the most pleasing in the gulf. 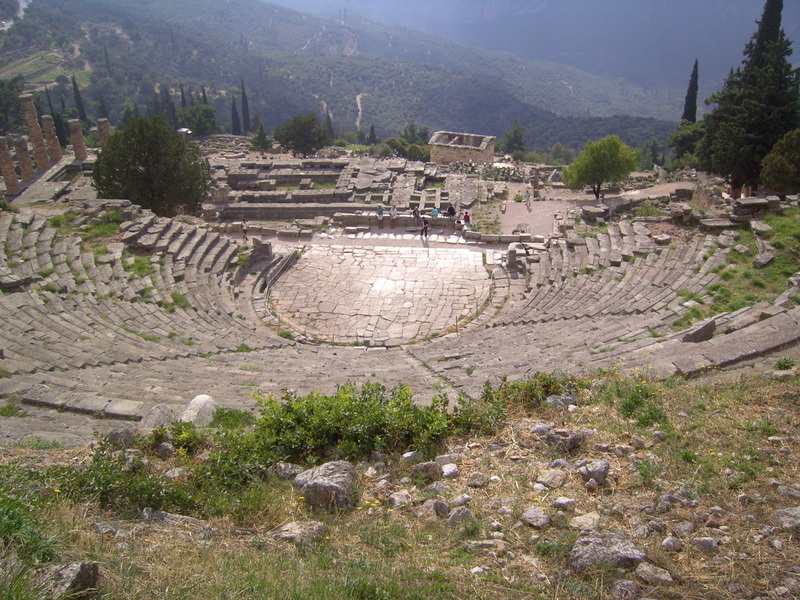 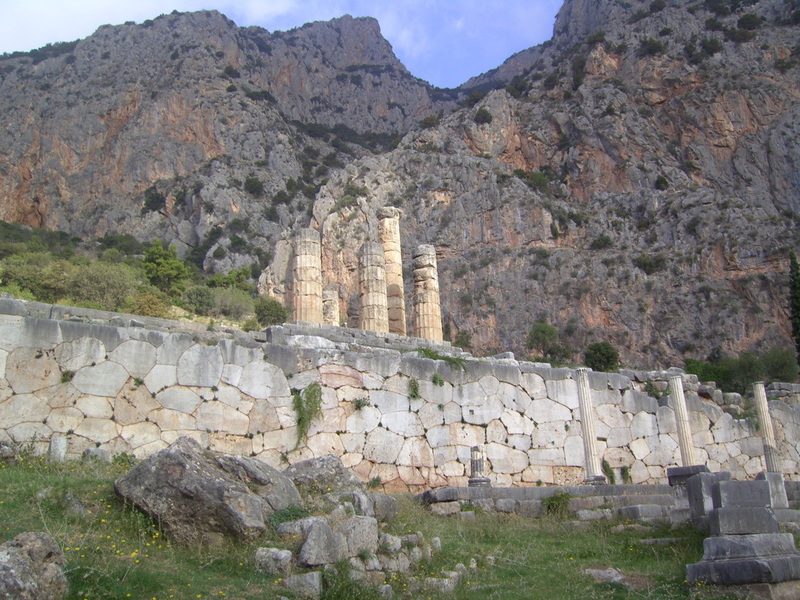 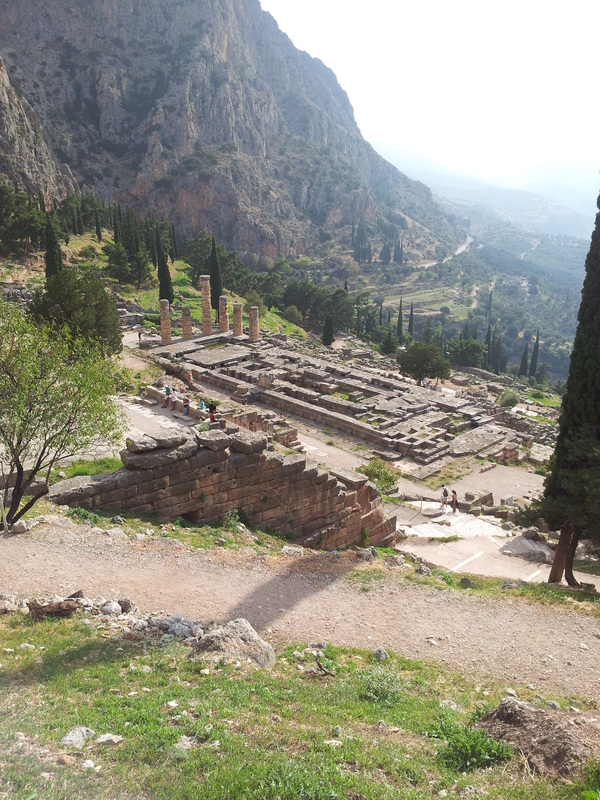 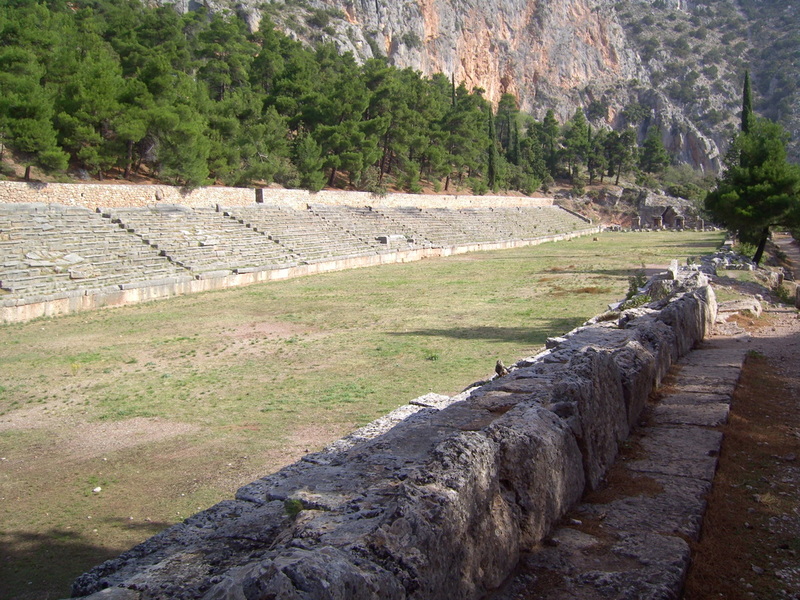 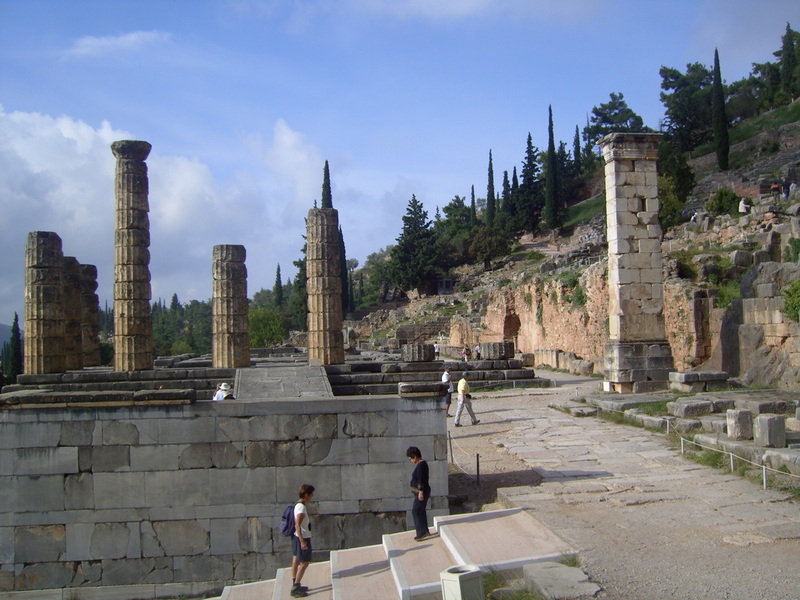 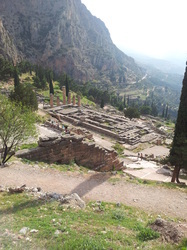 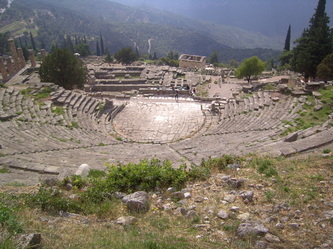 The following day we took a taxi into the mountains to visit ancient Delphi. 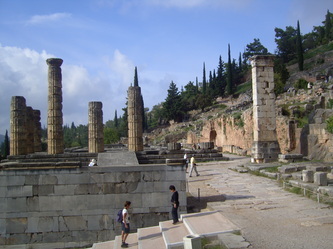 The site is acknowledged as one of the most spectacular and beautiful classical sites in Greece and was regarded by the ancients as the centre of the world. 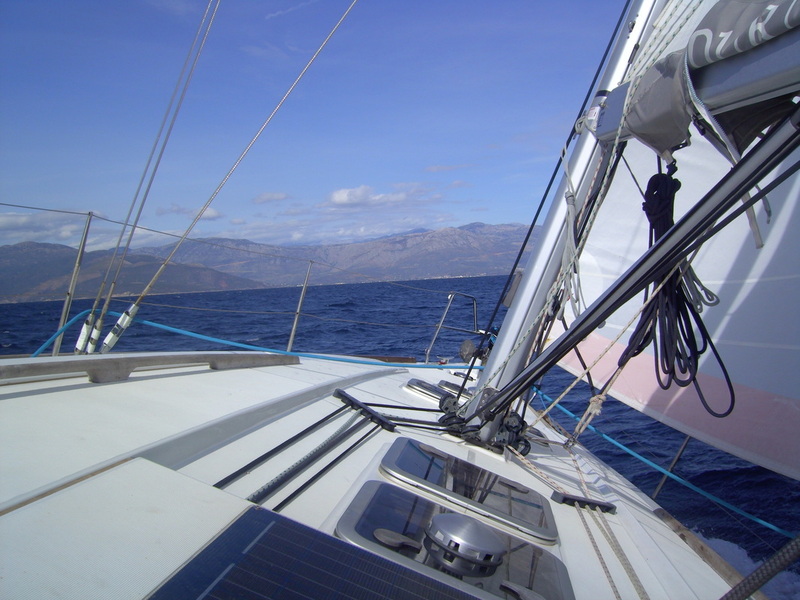 DAY 15 – Trizonia – 40nm. 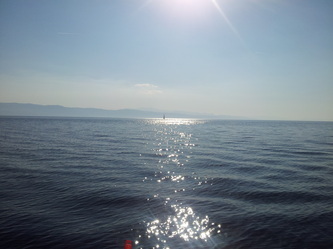 The best day of the trip. We beat into a F6W all day with 6ft swells and gusts over 30knots. 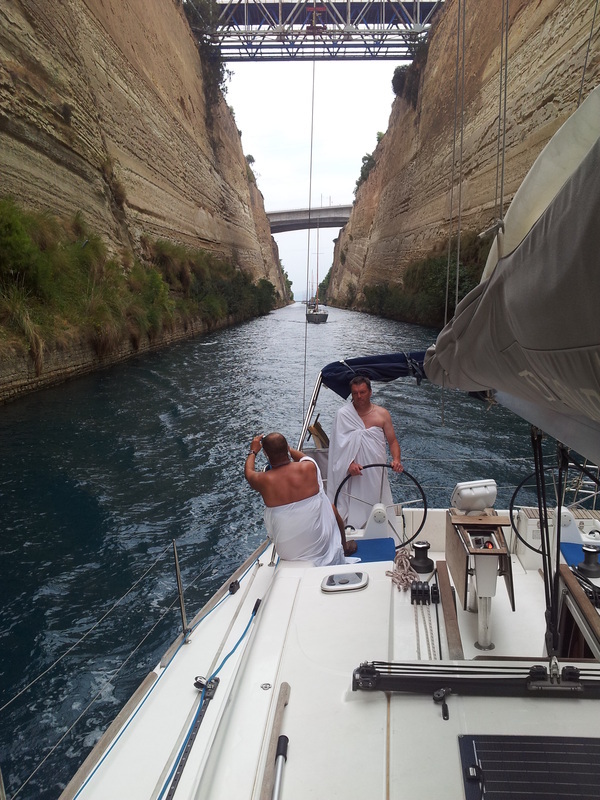 Everybody was knackered as we sailed into the entrance of Trizonia marina. 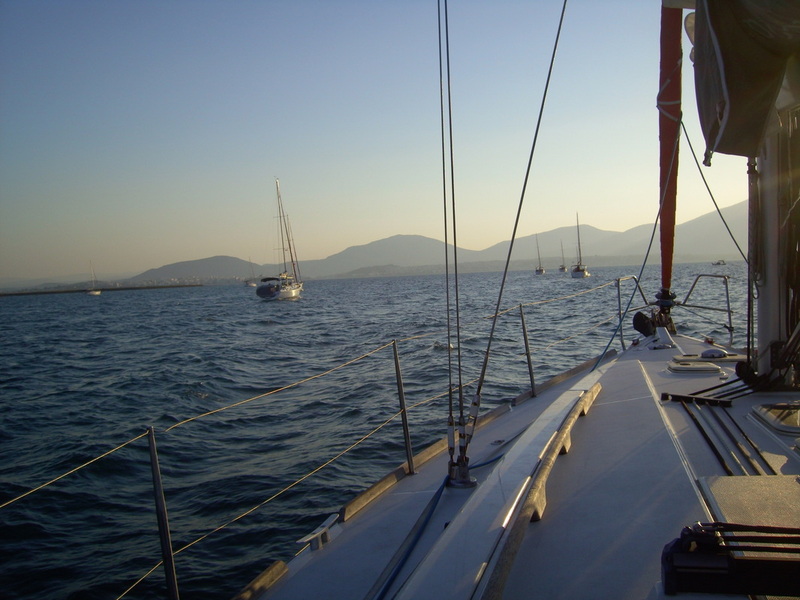 DAY 16 – Mesolongion – 39nm. We left Trazonia in the morning calm and after passing under the spectacular Rion bridge in the Gulf of Patras we ‘hove too’ for lunch. 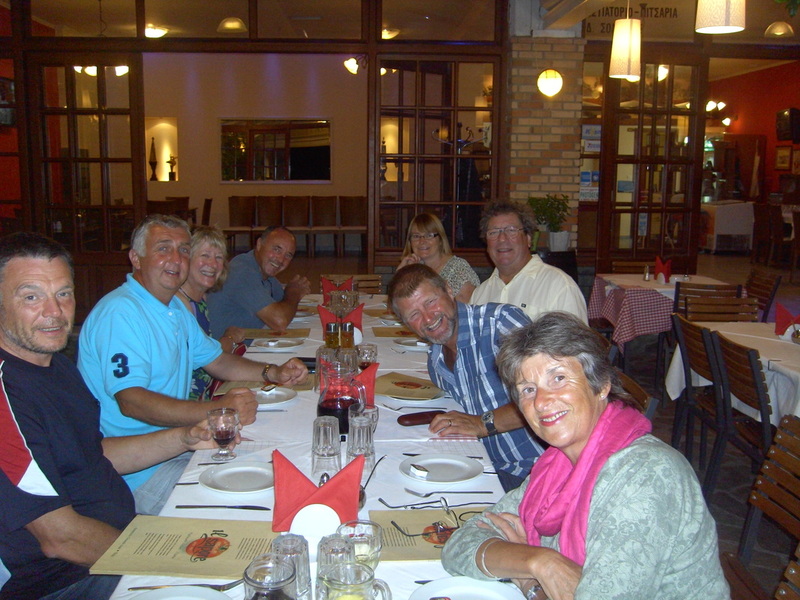 This was the calm before the storm! An hour later we ran into a violent thunder storm with torrential rain and 8-10ft swells. We donned our wet weather gear, stowed the hand-held VHF radio and mobiles in the oven and stood on deck watching lightening strike the sea all around the boat. Scary stuff! DAY 18 – Kalamos – 42nm. Another early morning start in the dark with a view to avoiding the forecast storm in the Ionian Sea that afternoon. 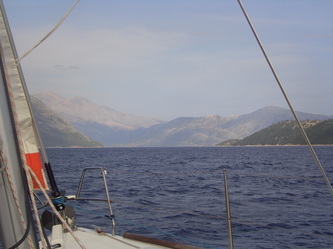 After motoring for most of the morning we decided to anchor in One House Bay on Atoko, a small islet to the west of Kalamos and wait for the wind to pick up. 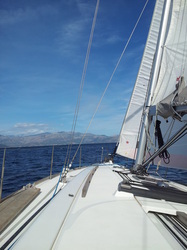 Pick up it did and we had a fantastic sail across to Kalamos. Dave was on the helm with 20 knots on the beam and 9.5knots registered on the plotter! 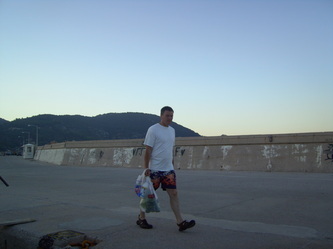 The best of the trip. Within minutes of mooring stern too in Kalamos harbour the heavens opened and torrential rain hammered the boat for an hour. DAY 19 – Kioni, Ithaca – 12nm. 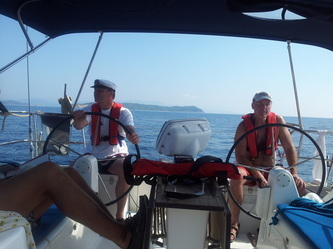 We set off for Fiskardho but after arriving in Kioni for lunch Mike refused to leave! 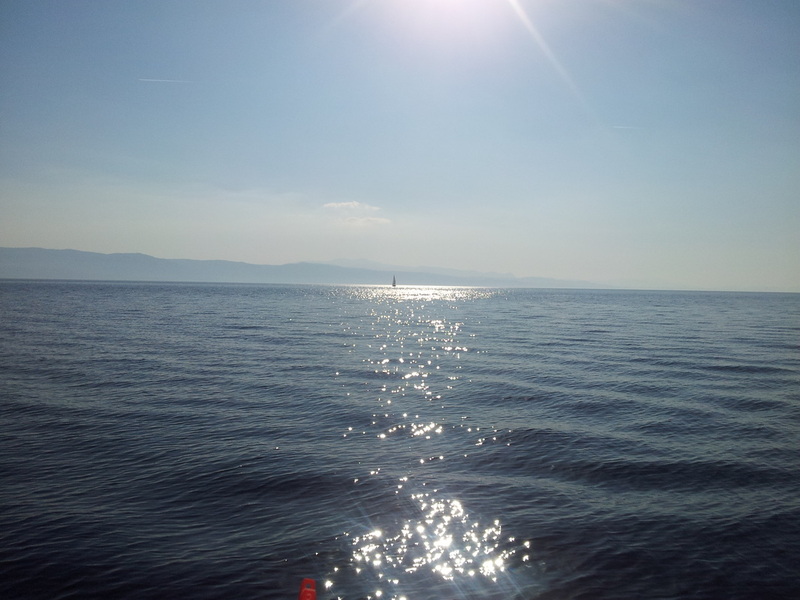 What a glorious spot. DAY 20 – Vathy, Meganisi via Fishkardho, Cephalonia – 31nm. 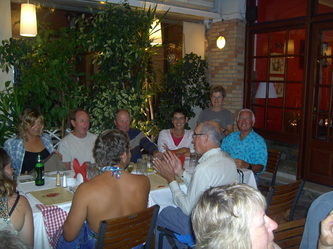 You cannot visit the Ionian Islands without calling at Fishkardho; said to be the Saint Tropez of Greece. 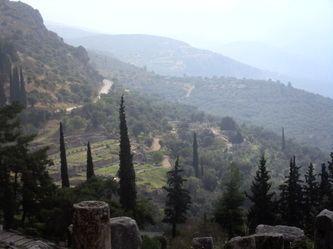 A beautiful place although a lot less cosmopolitan in October than in the height of the summer. 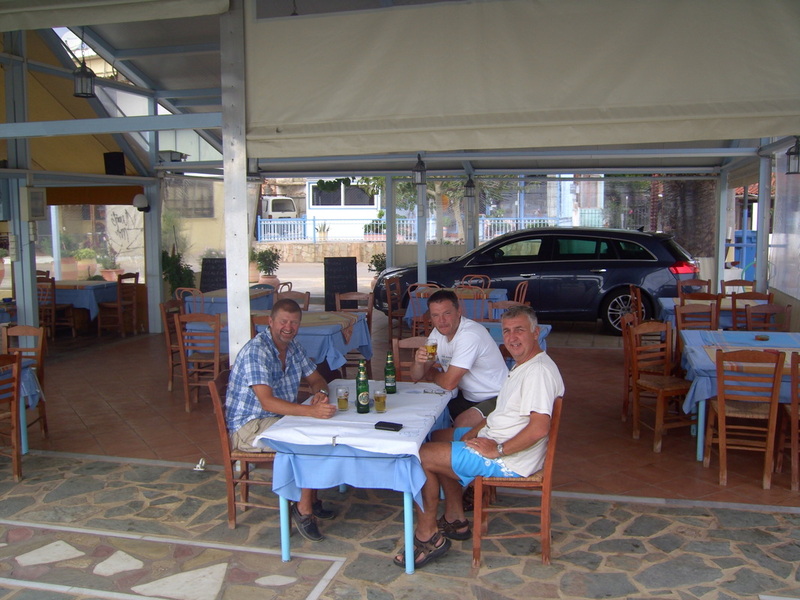 DAY 21 – Nidri, Lefkas. 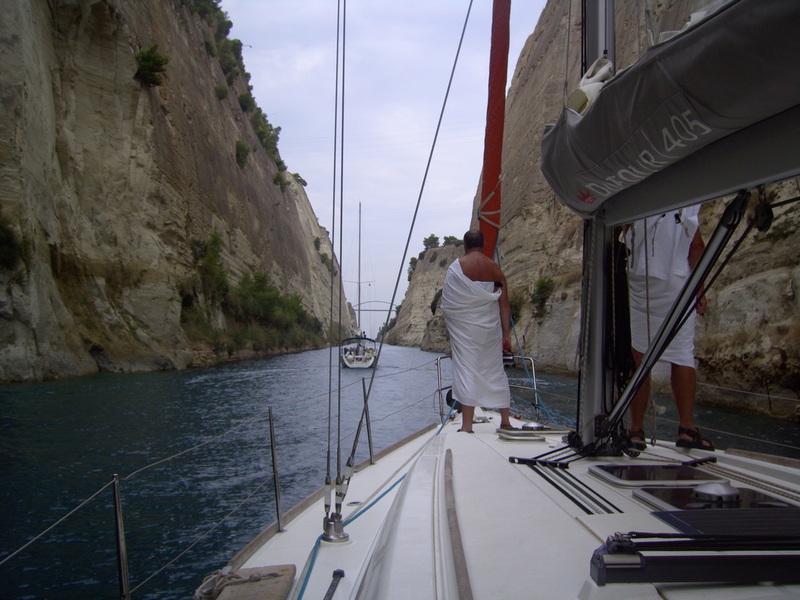 We spent our last day anchored with a long line ashore in the bay at Port Atheni on Meganisi. ‘Skinny dipping’ was the order of the day much to the amusement of the crew of another Neilson boat moored nearby!